We specialise in migrating and upgrading Microsoft SQL Server to the latest version of Microsoft’s data platform. Whether you prefer on-premises or a cloud-based solutions, we have the experience and expertise to migrate your mission critical business databases to the latest version of SQL Server with minimum downtime and disruption to your business. Typically, we help those who do not have time, skill or experience to understand the options available and/or execute a delivery, and, would prefer a controlled cost solution through a Capped / Fixed delivery. Upgrade SQL Server 2008 and SQL Server 2008 R2 – Out of Support! 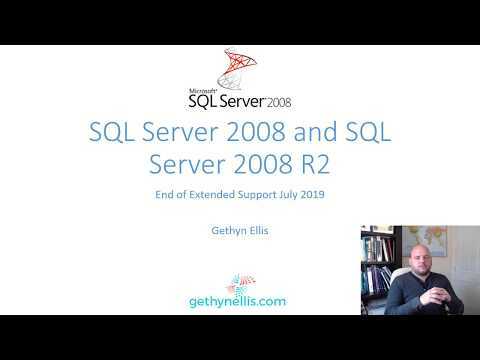 Both SQL Server and SQL Server 2008 and SQL Server 2008R2 go out of extended support with Microsoft in July 2019. Industry estimates suggest that 20-30% of organisations have database instances STILL ON SQL Server 2008R2 and below! You’ve been running these for years with no issues or problems, so what’s the rush? Well not upgrading COULD RISK COMPLIANCE with key legislation such as GDPR and PCI – DSS. Cyber Security - No Support means, NO SECURITY PATCHES, potentially putting your data & applications at risk. Cloud could be the future? You like the sound of the flexibility of the cloud or letting others worry about the technology? Perhaps you like the idea of a being able to innovate faster and more cost effectively? These are all good reasons to consider a move to the Cloud, whether that’s Microsoft’s Azure Platform or Amazon’s AWS. Why you might not have upgraded yet? There could be a number of reasons for leaving your critical business databases “as is”. Perhaps the applications the databases support require an older version, maybe the applications are also coming to the end of life, but the end dates do not quite match up? Maybe these applications are critical to the business and the business doesn’t want to disrupt the application by performing a migration? 1. Assess the risk, remain on out of support software – perhaps appropriate for non-production database instances or business applications nearing end of life. 2. Pay for extended support with Microsoft and continue to get security updates – option for those not wanting change, although costs up to 75% of licence fees? 3. Migrate “As Is” to Azure, continue to get security updates – perhaps appropriate for limiting technical & business risks, buys time (up to 3 years) to consider future. 4. Upgrade to latest version e.g. SQL Server 2017 On Premises – option for those needing to upgrade and preferring an on premises approach. 5. Upgrade to Azure platform – perhaps appropriate for those needing to upgrade and preferring a cloud approach. We are small, friendly, flexible, very experienced yet combine twenty years’ of delivering successful Microsoft SQL Server upgrades with twenty years’ delivering successful IT change. • Independent advice to help you pick the right strategy for your organisation. • We can help you execute the plan ensuring your costs are controlled. You can buy as much or as little as you want from us at a capped or fixed price. We have been performing database upgrades since 2007, starting with SQL Server 2000 to SQL Server 2005, SQL Server 2005 to SQL Server 2008 and SQL Server 2008R2. SQL Server 2008R2 to SQL Server 2012/2014/2016/2017. These have been undertaken in Private Cloud’s, On premise environments and across Virtual and Physical infrastructure. We have deployed SQL Server Infrastructure as a Service (IaaS – virtual machine in cloud), in both Microsoft’s Azure and Amazon’s AWS Clouds; and deployed databases to Azure SQL Database (Microsoft’s Platform as a Service – PaaS). We have conducted over 200 SQL Server training courses and published articles and books that discuss migrating and upgrading SQL Server. We have worked in a variety of sectors including Asset Management, Banking, Insurance, Logistics, Manufacturing, Not for Profit, Professional Services, Public Sector and Retail. We aim to offer a Seamless migration with minimal business disruption. We can help you keep the lights on and buy time to deal with your future strategy. It’s a very cost-effective solution – with our capped or fixed price model. We can help. PLEASE GET IN TOUCH. or chat with us on this site.